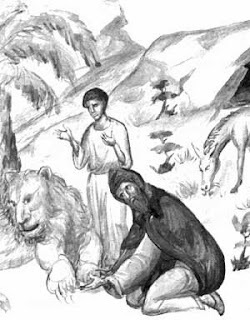 The venerable Gerasimos was born in saint-bearing Asia Minor, specifically in Lycia, in the seventh century, from devout parents. At one stage in his life, perhaps due to excessive zeal, he was led astray by the Monophysite heresy. The Monophysites did not accept that in the person of Christ the divine and human natures were united without change, without confusion, without separation and without division, but they claimed that the divine nature of Christ absorbed His human nature and therefore Christ only had one nature. However, he quickly understood his error, because he was a man with good intention and a humble mindset. He had the good habit of visiting and being counseled by sanctified people. From a scholarly ascetic named Euthymios he learned the truth concerning the two natures of Christ, and having realized his error he returned to the Church. Then he went to Jordan where he became a monk, and he tasted for several years the sweet honey of quietude. Later, when many monks gathered around him, who asked for his enlightened guidance, he was forced to establish a Coenobitic Monastery. Saint Gerasimos was strict, but only with himself. To others he was affable and lenient. He ate little, as much as was needed to sustain his life, and slept little as well. Indeed he taught that whoever wants to live longer should sleep less, because much sleep makes the body self-indulgent and therefore weak in labors and vulnerable to disease. He added: "Do you want to find more time in life? Stay fewer hours in your bed. Because this is a kind of coffin and takes away energy, which is the fundamental basis of life." Above we referred to the heresy of Monophysitism and spoke of its opinion regarding the two natures of Christ. At this point it is appropriate to do a little analysis to highlight the fact that, when the Orthodox faith is altered, then the method of treating human passions is altered, and thus our salvation is at stake. If Christ only had a divine nature, he could not undergo the crucifixion and His voluntary passion, because the divine nature is without passion. Christ hurt, wept and suffered as a man. As the sacred hymnographer chants: "You suffered as a man, You who are without passion in Your Divinity." And elsewhere: "But the Divinity remained without passion." Also, if Christ was only a man, He could not save humanity. Christ is the God-man, that is , perfect God and perfect man. He saves as God and suffers as man "to free us from the passions". The saints, who are the actual members of the Body of Christ, preserve the Orthodox hesychastic way of life, that is centered around prayer, worship and asceticism. The teaching of the venerable Gerasimos regarding sleep was essentially a word on asceticism. With the restriction of sleep and temperance he habituated the flesh (the carnal mind) to be subordinate to the spirit, since "the carnal mind is death, while the mind of the spirit is life and peace". With asceticism and unceasing prayer, especially the one-sentence prayer "Lord Jesus Christ have mercy on me", the nous, which often turns to error here and there, learns and becomes accustomed to be concentrated in the area of the heart, which is its natural position, and acquires uninterrupted memory of God. When it remains in this state, it is illumined and "the nous sees God", that is, it sees the uncreated glory of God as it was seen by the three disciples on Mount Tabor. The above, though it may be heard to be and seem difficult, is not unfeasible, since we verify it in the lives of the saints, old and new. And so we must turn our attention to this goal and this orientation that we may strive to attain it, since the purpose of our life is theosis, which is preceded by the purification of the heart from the passions and the illumination of the nous. When the nous is illumined and sees the glory of God, then the passions are alleviated and transformed. For the passions are not something foreign to human nature which must be uprooted and be rid of, but they are an "unnatural movement of the powers of the soul". That is, when the three powers of the soul - the intelligent, the incensive and the desiring - operate against nature, then we can speak of it being a passion. The natural movement of these powers is for man to think about God, to desire and adapt his life according to His will, and to turn his anger against the devil and sin. When, on the contrary, he is attached and enslaved to created and material things and thinks about other things, desires other things, does other things and turns his anger against his fellow man, with tragic consequences (grudges, hatred, murders), then we can speak of an impassioned and ill state that needs therapy. According to the teaching of Saint Maximus the Confessor, which is the teaching of the Orthodox Church, anger is healed by love, desire by temperance, and reason by prayer. "The incensive part of the soul is restrained by love, the desiring is withered by temperance and the intelligent is given wings by prayer. Thus the light of the nous is never darkened." The period of Holy and Great Lent in which we are in is offered for greater struggle and effort to treat our passions, since true fasting is not only abstaining from certain foods, but primarily, as we chant with the sacred hymnographer, "for the alteration of the passions, temperance of the tongue, abstention of anger and separation from desire." Source: Ekklesiastiki Paremvasi, "ΟΣΙΟΣ ΓΕΡΑΣΙΜΟΣ Ο ΕΝ ΙΟΡΔΑΝΗ", March 2001. Translated by John Sanidopoulos.